Nature's Bounty St. John's Wort can be taken three times daily and are able to be opened and made into an easy to consume tea. Warnings: Not intended for use by pregnant or nursing women. If you are taking any medications or have a medical condition, consult your doctor before use. Avoid excessive exposure to sun and other sources of ultraviolet light when using this product. Discontinue use and consult your doctor if any adverse reactions occur. Not intended for use by persons under the age of 18. Notes: Artificial Colors Free. Artificial Flavors Free. Artificial Sweeteners Free. Preservatives Free. Sugar Free. Starch Free. Milk Free. Lactose Free. Soy Free. Gluten Free. Wheat Free. Yeast Free. Fish Free. Sodium Free. Recommended Use: For adults, take one (1) capsule three times daily. Capsules may be opened and prepared as a tea. 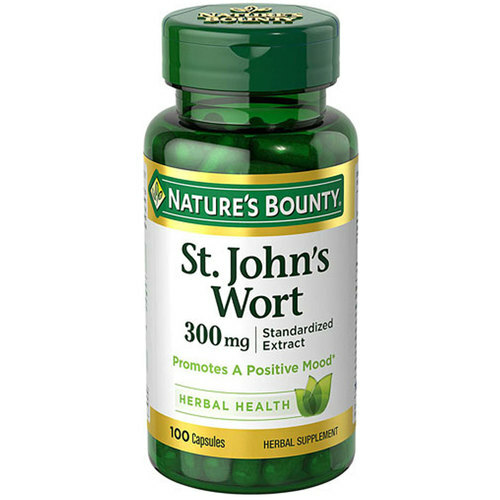 The customer reviews posted below are based on individual consumer experiences and may NOT necessarily represent what expected results will be from using or taking Nature's Bounty St. John's Wort - 300 mg - 100 Capsules. These results may not be typical and you should not necessarily expect to receive the same results. Actual results may vary. I loved the product, it made me much calmer on a daily basis. For depression, malaise, sadness, this supplement will make you improve for sure, the people of my daily life who used it, thanked for having known this plant, thank you evitamins.